Mark Mancilla is a Certified Personal Trainer (NASM), Weight Loss Expert, Author, and owner of Max Body Fitness. Mark has seen over 300 orange county residents to their health and fitness goals by utilizing his very comprehensive fitness system. He is referred to by many as a 'Fitness Expert' and his rapid emergence as the premier fitness trainer and coach in Huntington Beach. At one time 70 pounds overweight, Mark brings a uniquely compassionate, 'seize the day' attitude and enthusiasm to everything he does. Mark launched Max Body Fitness in 2007 and is the driving force behind its rapid growth, serving already over 300 clients and customers. Mark is a featured author for the Fitness Expert Network, the Better Body Newsletter and is the co-author of the Ebook, The TRUTH About Weight Loss. Chaz Cameli is a certified personal trainer (NASM CPT, CES,PES,) and certified TRX instructor, specializing in weight loss, conditioning, sports performance, and Brazilain Jiu-Jitsu. 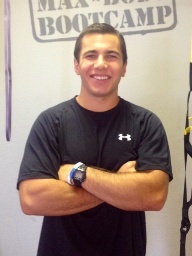 Chaz has been actively working in the fitness industry for the past four years, serving many OC residents and helping them attain their fitness goals. Growing up Chaz has been physically active, however it was not until he started Brazilian Jiu-Jitsu did he get in the best shape of his life. This inspired him to pursue and help others to live a healthy and active lifestyle. Chaz always give 110% to all of his clients ensuring that they will meet their goals safely and effectively.